This weekend I hit the race expo for the HSBC Calgary Marathon. The expo was being held at the Mewata Armoury downtown. 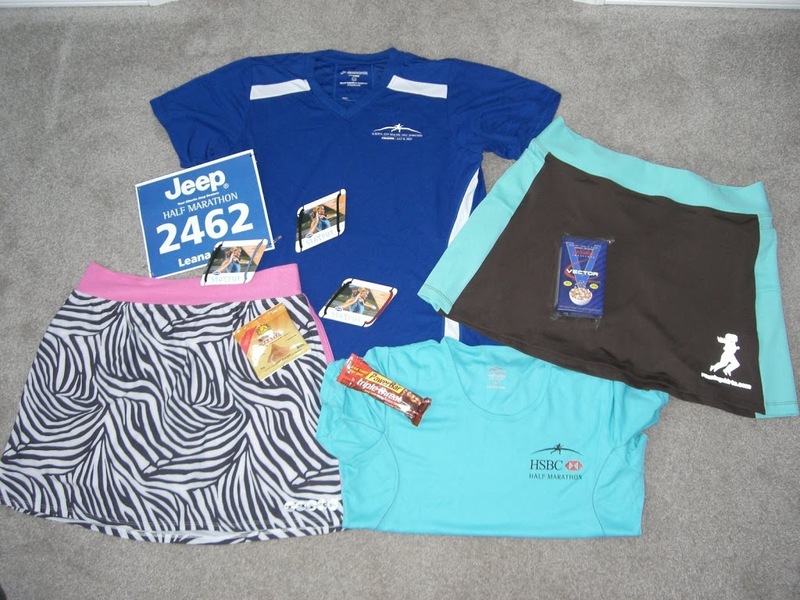 Packet pick up was smoothless as I got my race number, timing chip, shirt and swag bag. Once I grabbed all of that I was able to turn my chip in and get my personal chip registered, then it was time to look at the goodies! First up was all of the official race merchandise. Brooks is the official gear sponsor and they had jackets, tees, long sleeve half zip tops, all of which you could get with either the half or the full marathon logo. You could even get a finisher’s shirt that they will imprint with your finishing time on it once you are done. The Running Room is also a big sponsor of the race, and they had a lot of gear for sale. The founder of the Running Room, John Stanton, was there signing copies of his books. Plus they also had a prize wheel you could spin, and I won a coupon for 20% off my next purchase at the Running Room. Other exhibitors included PowerBar (you could sample one of their drinks), Goody (more Stay Put hair elastics), CanMar Grain Products (sample some of their golden roasted flax seed), Accelerade (they make a sports drink with a 4:1 ratio of carbs to proteins, but I’m not sure what I thought about the taste), Herbalife (free sample of their Liftoff energy drink) and tons more. I picked up a skirt from runningskirts.com in choqua which I can’t wait to try out. I also was able to get my zebra print Gym Girl from Skirt Sports as well. You could also purchase tech shirts from last year’s race at a really good price, and the aqua colour of last year’s shirt goes really well with my new skirt! 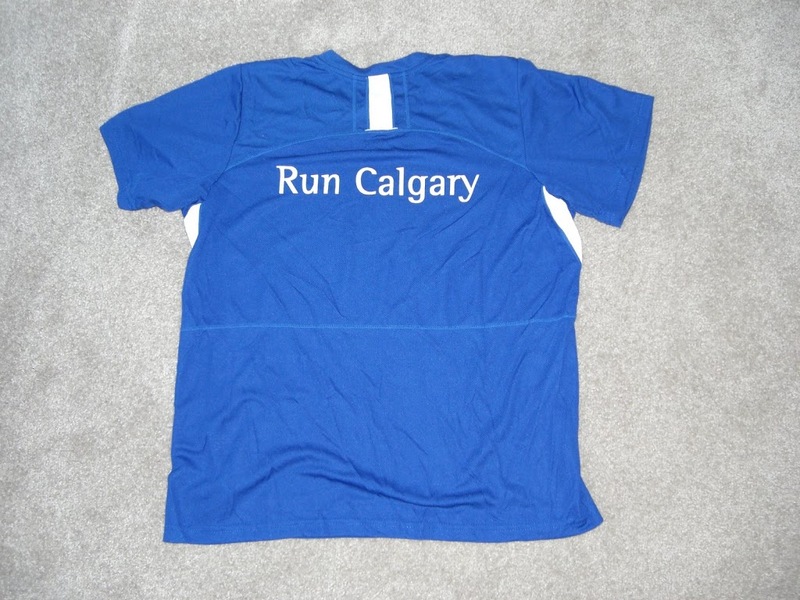 The blue and white shirt is from this year’s race, and it says “Run Calgary” on the back. 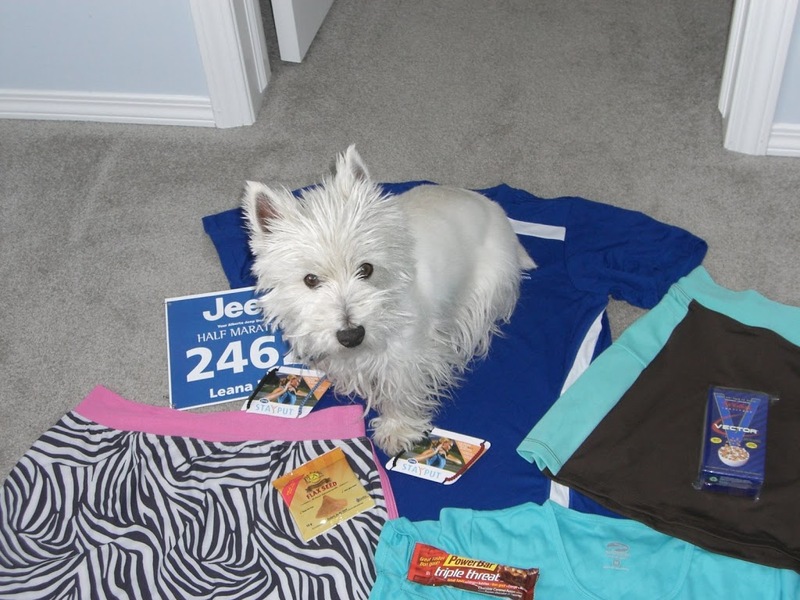 My dog Finlay wanted an up close look at all of the stuff that I picked up at the expo obviously..!! The run starts at 7 am tomorrow. The weather forecast is OK, but not the best for the morning: 13C rising to 21C (55F to 70F), cloudy, with a 40% chance of showers. Here’s hoping the rain holds out, but otherwise the temperature and cloudiness sound pretty good.